When musicians manage to find their audiences and (especially) some measure of success along the way, rare indeed are those who abandon such formulaic security for the uncertain, often harsh territory of artistic adventure and freedom. 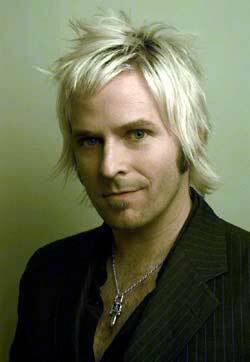 Kevin Max is one of those rare artists. The former dcTalk vocalist didn't just say goodbye to one of the most successful, celebrated groups in the history of Christian music a few years back; he uprooted himself from his longtime hometown of Nashville and headed west to Los Angeles-a city famous for dashing the dreams of most every musical hopeful who giddily bounds down Hollywood Boulevard with six-string in tow after hitchhiking from Nowheresville. "Since being out here, it's been a struggle to find myself," Max says of his first years living in Southern California. "I played the Viper Room and the House of Blues, and then I wondered, 'What's my next step?'" As it turns out, the next chapters in Max's musical life would lead to unexpected and perspective-altering relationships with an impressive list of industry heavyweights-and ultimately to his newest solo album (and first with Northern Records), an ear-opening, poetic, alt-rock juggernaut he calls The Imposter. "The idea of 'the imposter' comes from Brennan Manning's The Ragamuffin Gospel and Abba's Child," Max reveals. "dcTalk did weekend retreats with Brennan, and we'd get to talk. He'd explain that the imposter is in all of us-it's that fleshly part that isn't willing to give up the ghost, that part that wants to take over the spirit in us. That's what this album is about-the fight between the flesh and the spirit." "I'm not completely patient in the song, I admit," Max notes. "But God created heaven for us, and I want to taste it. Ultimately it's about the realization that you need to dig deep to find out what you believe in-but at the same time, I'm needy and greedy; I want my place of rest now." Already the author of two books of poetry-At the Foot of Heaven and Detritus of Dorian Grey-the fact that Max would travel so deep in his mind and heart for such spiritual truth isn't surprising. But factor that along with his keen powers of observation and uncommon openness to people with all sorts of philosophies, beliefs, and ideas, and you quickly understand why The Imposter is so incisive, artistic, and uncompromising-and why the album is so reflective of his new L.A. life. "It's amazing how many diverse characters I've met," Max says. "The bonding and the making of new relationships has only encouraged my faith, it's been a lot of fun." The most intriguing of these characters include his first writing partner since moving west, the one and only Van Dyke Parks (The Beach Boys, The Byrds, U2, among many other luminaries), as well as Mark Hudson (Ringo Starr) and Warren Cucccurullo (Missing Persons, Duran Duran). One of Max's biggest thrills since his L.A. adventure began was a chance encounter with Morrissey-by far Max's biggest musical idol-in a neighborhood coffee shop. "Turns out he lives on my block!" Max gushes. "I gave him a copy of my first solo CD, Stereotype Be, and he actually e-mailed me saying he appreciated it." Another track that finds its origins among the spiritual pilgrims Max has befriended in the City of Angels is "Your Beautiful Mind," a stick-in-your-brain, atmospheric, piano-based ballad. "I wrote this for a friend of mine who's an atheist," Max reveals. "She's a university student, and she constantly debates me on Creation, Christ-everything to do with who God is. The song is a conversation of sorts between us, and in the opera of my mind, she is a believer at the end. "I started out writing a song about a wayward soul who moved to Hollywood to become a star, but there are parallels to the Body of Christ," Max explains. "I drew imagery from Mary Shelley's Frankenstein to say that looks can be deceiving and true worth can't be found on the surface. Basically, it's a song of encouragement." But for all the inspiring new songs on The Imposter, Max's favorite track by far is his vocally blazing, gospel-tinged cover of Bob Dylan's "When He Returns" (from Slow Train Coming). "To me it brings it all together," Max says of the piano-and-vocal track, the sparest song on the album. "I kept the same lyrics, of course, but I changed a few things-it's a little more gospel. It's a great moment." When all is said and done, Max hopes The Imposter can take on a life of its own. "I want to make music that gets brand new people listening to it. And I want to bridge the gap between Christian and mainstream audiences," he declares. "I believe the only way I can have an impact on both is to take off the mask-no hiding my weakness and no apologies for my faith."